(2 Cor 1:20 NIV) For no matter how many promises God has made, they are “Yes” in Christ. And so through him the “Amen” is spoken by us to the glory of God. Let’s look at some of the examples of God’s provision in the Old Covenant. (1 Cor 10:1 NIV) For I do not want you to be ignorant of the fact, brothers, that our forefathers were all under the cloud and that they all passed through the sea. (1 Cor 10:2 NIV) They were all baptized into Moses in the cloud and in the sea. (1 Cor 10:4 NIV) and drank the same spiritual drink; for they drank from the spiritual rock that accompanied them, and that rock was Christ. (1 Cor 10:5 NIV) Nevertheless, God was not pleased with most of them; their bodies were scattered over the desert. (1 Cor 10:6 NIV) Now these things occurred as examples to keep us from setting our hearts on evil things as they did. God still wants us to obey Him. Look at the result of obeying God under the lesser covenant. Think of it this way. If you have the choice of receiving a fifty-dollar bill, or a hundred dollar bill, which one will you take? $100? Why? They are both money. Why? Because the $100 bill is more. Think of the covenants of God this way. The old covenant was good, but the new covenant is more. 4 The fruit of your womb will be blessed, and the crops of your land and the young of your livestock–the calves of your herds and the lambs of your flocks. 9 The LORD will establish you as his holy people, as he promised you on oath, if you keep the commands of the LORD your God and walk in his ways. 11 The LORD will grant you abundant prosperity–in the fruit of your womb, the young of your livestock and the crops of your ground–in the land he swore to your forefathers to give you. Do not turn aside from any of the commands I give you today, to the right or to the left, following other gods and serving them. You are redeemed from the curse. Some day, for fun, read each verse of Deuteronomy 28:15 until the end, like this. As you read out loud each of the curses, say after each one. Praise God! Jesus redeemed me from the curse of the law. None of this junk can touch me, I’m a child of the king. therefore in hunger and thirst, in nakedness and dire poverty, you will serve the enemies the LORD sends against you. He will put an iron yoke on your neck until has destroyed you. (2 Cor 8:9 NIV) For you know the grace of our Lord Jesus Christ, that though he was rich, yet for your sakes he became poor, so that you through his poverty might become rich. Let’s look at the words of Jesus, recorded for us in Matthew 6. I call it my “Don’t worry, be happy”, verses. 25 “Therefore I tell you, do not worry about your life, what you will eat or drink; or about your body, what you will wear. Is not life more important than food, and the body more important than clothes? 27 Who of you by worrying can add a single hour to his life ? 28 “And why do you worry about clothes? See how the lilies of the field grow. They do not labor or spin. 30 If that is how God clothes the grass of the field, which is here today and tomorrow is thrown into the fire, will he not much more clothe you, O you of little faith? Yes, obedience to God will always produce basic provision. Why? God loves you. You are His child. If He created you, he has provided for you. Your job is to pray, obey, and study the word to learn his ways, so that you can have everything He wants you to have. Yet, God wants us to move from the land of almost enough into more than enough. 700 years before the Law was given, Abraham paid tithes. 500 years before the Law was given, Jacob paid tithes. Notice here, what the Bible says about the love of money. It’s the root of all evil. It’s Satan’s main root in controlling people. 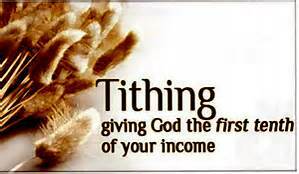 When you begin to tithe and believe God in the area of finances, you attack his main root in the earth. That’s why Paul had to tell us to “Fight the good fight of the faith”, here. The issue is a heart issue. Who is Lord of your money? Where is your trust? Are you trusting God to provide, or are you trusting in your own strength? Remember, Satan steals, people hoard, but God so loved the world that He gave… Giving is the greatest expression of love. When you tithe, it’s an act of war. Jesus taught us to pray our Father, that “ your kingdom come, your will be done” where? In the earth, as it is in heaven. Which heaven is he talking about here? Well, the third heaven of course, where He calls home. The place with streets of gold. People say, now gold is bad. God doesn’t hold that opinion. Everyone say “good gold”. No, gold is not your enemy. It’s your heart. Where will you place your trust? Is it in God, to give you all things richly for you to enjoy? Or in the beggerly things of this world that are not designed to satisfy the deep things of your heart. I am convinced that tithing is spiritual warfare. Why? Haggai 2:6 For thus saith the LORD of hosts; Yet once, it is a little while, and I will shake the heavens, and the earth, and the sea, and the dry land;7 And I will shake all nations, and the desire of all nations shall come: and I will fill this house with glory, saith the LORD of hosts. Luke 4:5 And the devil, taking him up into an high mountain, shewed unto him all the kingdoms of the world in a moment of time.6 And the devil said unto him, All this power will I give thee, and the glory of them: for that is delivered unto me; and to whomsoever I will I give it. I believe Satan showed Jesus the second heaven, where he ruled as god of this world. Otherwise this would not have been a true temptation. I believe when we tithe, we make a declaration before God Almighty that Jesus is Lord of our provision, and that the victory that Jesus won on the cross, is in force and in place in our lives. Haggai 2:21 Speak to Zerubbabel, governor of Judah, saying, I will shake the heavens and the earth;22 And I will overthrow the throne of kingdoms, and I will destroy the strength of the kingdoms of the heathen; and I will overthrow the chariots, and those that ride in them; and the horses and their riders shall come down, every one by the sword of his brother. I believe this is a prophetic book speaking not only to Zerubbabel, but to us the church today. God is now shaking the heavens and the earth, destroying the strength of the kingdoms of the heathen. What is the strength of these kingdoms? I believe it is the same strength Jesus saw when tempted by Satan. Devils ruling through the minds of men. We are the church where these gates of hell shall not prevail, for Jesus has come to destroy the works of the devil. The earth is God’s and we are to rule and reign here as His ambassadors. 18 ¶ Therefore shall ye lay up these my words in your heart and in your soul, and bind them for a sign upon your hand, that they may be as frontlets between your eyes. Deut 11:19 And ye shall teach them your children, speaking of them when thou sittest in thine house, and when thou walkest by the way, when thou liest down, and when thou risest up. See it? If you give yourself totally to God, and His word, and are faithful to walk with Him. He is the same God, His will is for you to experience days of heaven upon the earth. 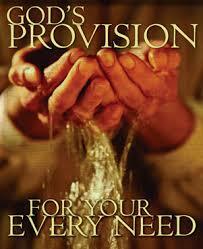 As far as God is concerned, your needs have already been provided for you, where? In heavenly places in Christ. How do we get them? Well, Christ means the anointed one and His anointing. It is the anointing that breaks the yoke. How do we generate an anointing that will produce financial deliverance? We tithe, we obey God, and then we exercise faith in God’s word. When you tithe you declare before God, the great cloud of witnesses that went before, and the holy angels, that this world is not your source. Jesus is my provider, and I am no longer limited to this world and my strength to provide. You need to see this as an act of war. God has already provided for you all spiritual blessings as His child. When you tithe and pray, you are simply taking what is rightfully yours. He then shakes the heavens for you, and the wealth of the sinner that is stored up for the righteous, begins to come into your hands. On what should I pay tithes? 31 If a man redeems any of his tithe, he must add a fifth of the value to it. 32 The entire tithe of the herd and flock–every tenth animal that passes under the shepherd’s rod–will be holy to the LORD. Who shall I pay them to? 21 “I give to the Levites all the tithes in Israel as their inheritance in return for the work they do while serving at the Tent of Meeting. 23 It is the Levites who are to do the work at the Tent of Meeting and bear the responsibility for offenses against it. This is a lasting ordinance for the generations to come. They will receive no inheritance among the Israelites. The answer to the question as to where we pay tithes is in this verse. You are going to pay them to men that are set apart by God for His work in the ministry. Eph 4, five fold ministry gifts. 3 Without father or mother, without genealogy, without beginning of days or end of life, like the Son of God he remains a priest forever. Just think how great he was: Even the patriarch Abraham gave him a tenth of the plunder! When should I pay tithes? What if I do and what if I don’t? 9 You are under a curse–the whole nation of you–because you are robbing me. “Then all the nations will call you blessed, for yours will be a delightful land,” says the LORD Almighty. Notice here. When you tithe, you make a solemn declaration before God, the angels, the great cloud of witness that have gone before us, and Satan and all his evil bunch. Yes, you declare in the heavenlies that this world is not your source. Jesus is Lord of my money. No I’m not trusting in my riches or my own strength of arm to provide for myself, but am taking Jesus as my provider. Jehovah-Jireh, El-Shaddai, the God who is more than enough. This is one of the few places in Scripture where God dares us to test Him. I tithe, Karen tithes, and your church tithes on every dollar that goes through the bank account. When to Canada from Tulsa, we had an old car, and pretty much nothing, and we gained a computer, T.V. , appliances, a satellite dish, and many other financial blessings, all of which are paid for, cash. Why? Because we are tithers and givers, and God supplied for us financially. In fact, we have determined to see how much we can believe God for, so that we can increase our giving. God will do the exact same thing for you if you tithe and obey Him, He is a good God, who loves you, and He is no respector of persons.